You can access your Connect/Google Apps account on your iOS device using either Apple's built-in Mail app or with Google's custom Gmail app. 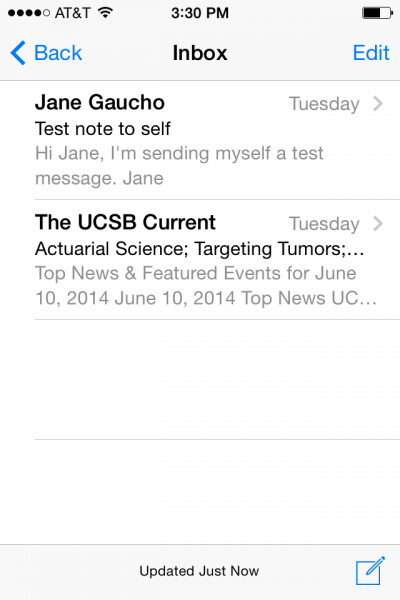 We recommend the Gmail app for the best experience, but either option will work great. Open the App Store app, search for "Gmail" and install the "Gmail - email from Google" app. 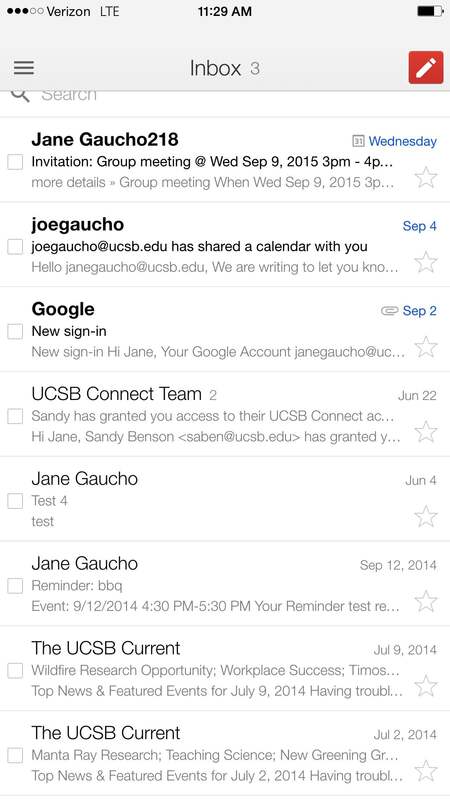 Open the Gmail app and log in with your Connect Address (UCSBnetID@ucsb.edu) for the Username, and UCSBnetID password, and click Sign In. You will then be taken to your Inbox or Important mail folder. You can click on the hamburger icon to change folders or switch accounts. 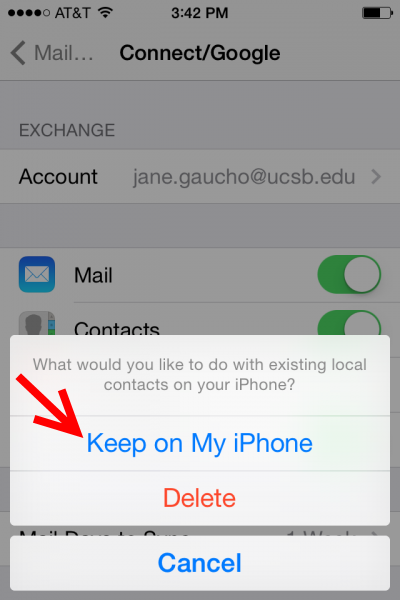 Open the Settings app, select Mail (or in some iOS versions, Accounts and Passwords then Mail), select Accounts, and then select Add Account. On the Add Account screen, choose Exchange (yes, Exchange, not Google) as the account type. Enter your email address (this could be firstname.lastname@ucsb.edu or your department email address such as: something@dept.ucsb.edu), your UCSBnetID password, and a Description such as Connect/Google. 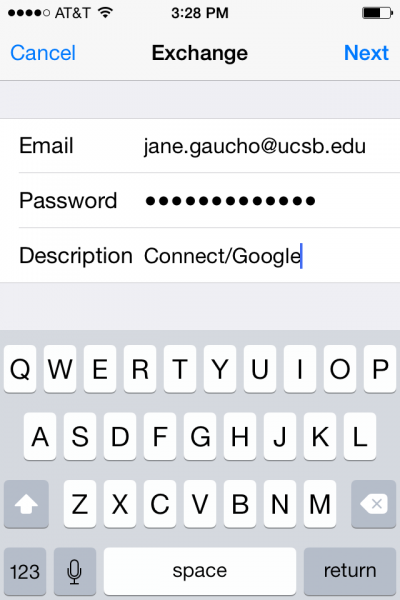 NOTE: If you have activated 2-factor authentication ("2FA") for your Connect account, you must use the "app password" you created for Mail on your iPhone/iPad. For more information on 2FA and app passwords, go here. 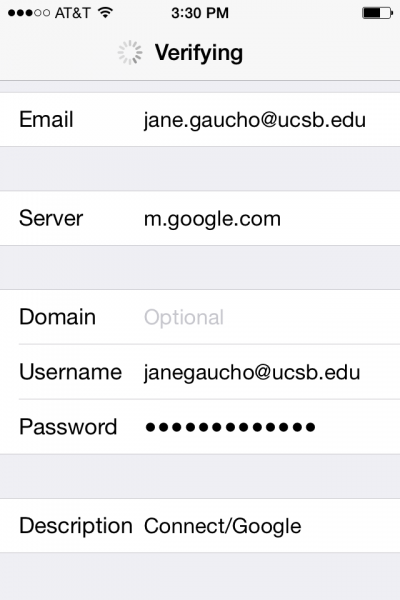 Enter m.google.com for Server, your Connect Address (UCSBnetID@ucsb.edu) for the Username, and UCSBnetID password, then click Next. Choose the features you want to enable. Click Save. Note for Calendar-Only customers, you only need the Calendars option selected. 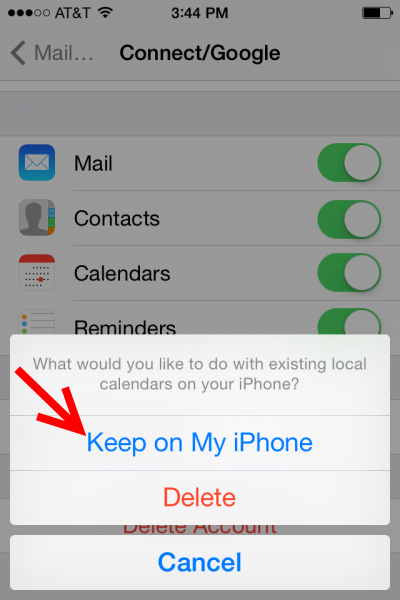 You will get asked the following when you turn on Contacts and Calendars on iPhone (not iPad). Tap Keep on My iPhone. 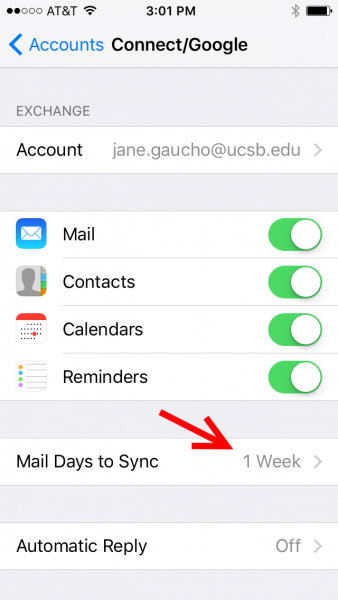 NOTE: If desired, go back to Settings to increase the number of days your client will sync. You may want to sync using wi-fi after increasing the range to minimize your data charges. Note: Make sure you are not already logged into your personal Gmail account. Check Enable "Send Mail As" for this device and Enable "Delete Email as Trash" for this device, then tap Save at top right. Open the Mail app, and choose the one you just created, typically named Connect/Google.